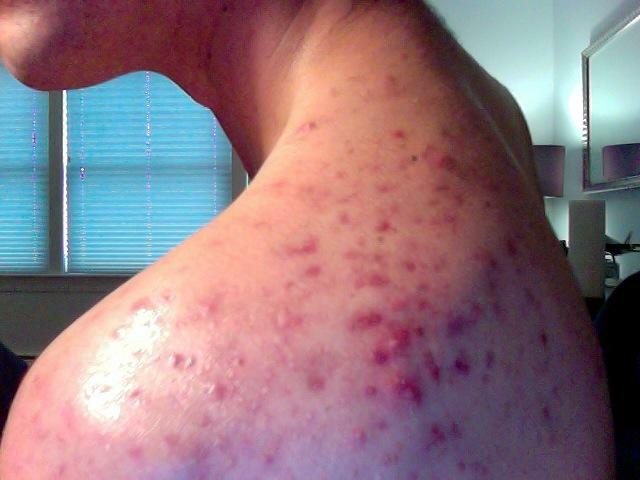 Im 18 and have been dealing with this for YEARS now and when i finally get it off my face, the acne comes back even harder on my back and now every F**king day, self confidence gets lower and lower and lower from where its already low point is seeing this disease on my back. Half of what I think in my head is about these scars and the nodular bumps on my back. Im going on vacation in about a month and a half and the stupid dermatologist doesn't help at all by making my first appointment AFTER i get back. Im seeing the doctor next week to ask to go on accutane because I can't deal with this ANYMORE! I hate it ! i just f**king hate it! But i need to know what to do NOW since nobody else is helping me to reduce the appearance of the these scars before I go on vacation. Because its either gonna be get rid of them in a month and half or sit on the beach in the shade with a shirt on for 2 weeks and not go in the water at all (or basically ruin the whole trip). PLEASE I NEED HELP. okay from now until the trip you need to eat CLEAN and do a cleanse - exfoliate your back, apply a retinoid nightly and let it do its thing. If you play a sport, or work out, DO NOT let your sweat dry into your skin, this is so important. Unsure if you are still in high school or not but if u play a sport, go right to the locker room and shower, and put a clean shirt on, get that sweat off your back. big salads including spinach, tuna, avacados, carrots, mushrooms, tomatoes, sunflower seeds, pumpkin seeds, etc. Things will be great - just eat clean, clean your skin immediately after working out, exfoliate once a week, get a retinoid and in a month and a half it will be better. Only accutane can help you but you might end up just like me, now I have keloid/hypertrophic scars. Just don't pick at them and take accutane you'll need to take whole course that's like 4-6 months. I agree - accutane is the best option BUT since you cant take it before your trip, that is why i suggested that stuff above! Oh also, would it be good to go to a tanning booth a few times? I live in maine where my back hasn't seen the sun in like 5 months so I think It would be good for it to see the light once again. Im more worried about all the scars that are there than the current acne, which will go away soon. get a epsom salt/peroxide detox bath. see if it works. How are things going? When do you leave again? ?